In this section, we look at what electricity costs and how much is purchased. Charges for retail electric service are based primarily on rates approved by state regulators. 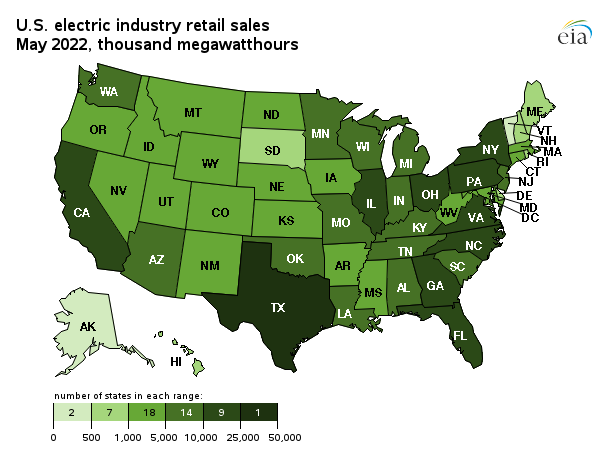 However, a number of states have allowed retail marketers to compete to serve customers and these competitive retail suppliers offer electricity at a market-based price. 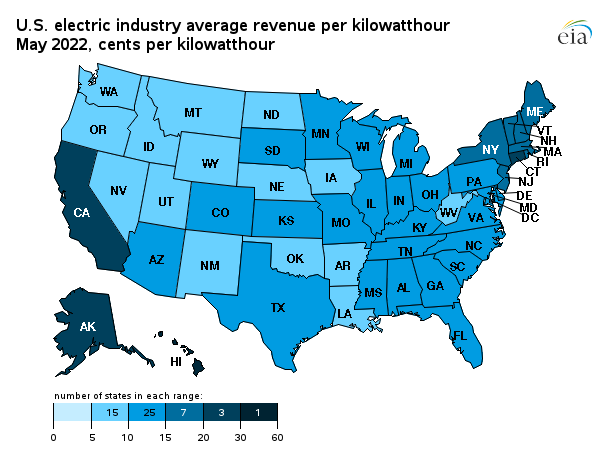 EIA does not directly collect retail electricity rates or prices. However, using data collected on retail sales revenues and volumes, we calculate average retail revenues per kWh as a proxy for retail rates and prices. 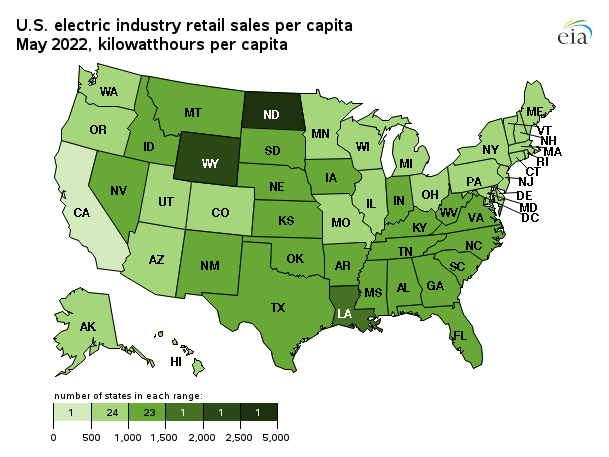 Retail sales volumes are presented as a proxy for end-use electricity consumption. Average revenue per kilowatthour figures decreased in 27 states in February compared to last year. 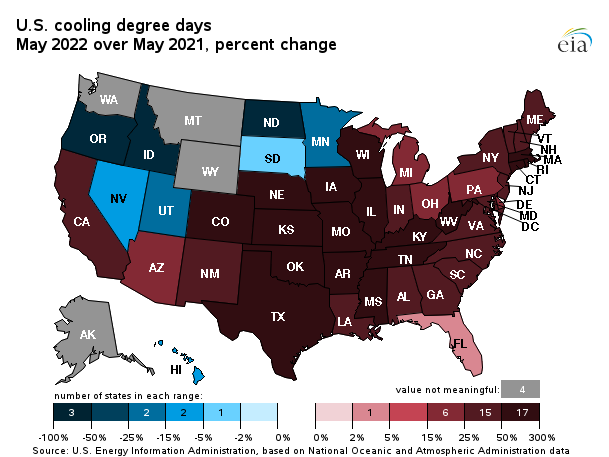 The largest declines were found in Maine (down almost 20%), West Virginia (down almost 10%), and Missouri (down almost 7%). 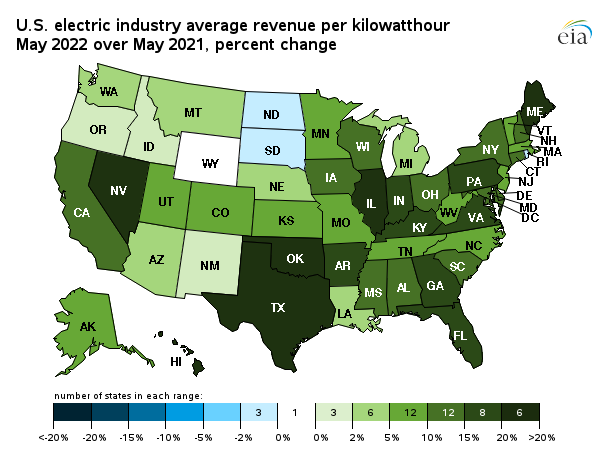 Twenty two states and the District of Columbia increased revenue per kilowatthour compared to last year, led by Rhode Island (up almost 10%), followed by Connecticut (up almost 6%), and Hawaii (up over 5%). Total average revenues per kilowatthour (kWh) in February 2019 were down by 0.5% from February 2018, to 10.43 cents/kWh. Average revenues for the Transportation sector rose by 1.7%. The Residential sector followed, rising slightly by 0.3%. The Industrial sector dropped by 1.9% and the Commercial sector was down by 1.2%. Total retail sales increased by 1.4% from February last year. The Transportation sector rose the most, climbing by 5.3%, followed by the Residential sector, which increased by 2.6%. The Commercial sector rose slightly, up 0.7%. This was followed closely by the Industrial sector, which increased by 0.6%. State retail sales volumes were down in 13 states and the District of Columbia in February compared to last year. Hawaii had the largest year-over-year decline, down just over 8%. Alaska showed the next largest decline, down just over 7%. 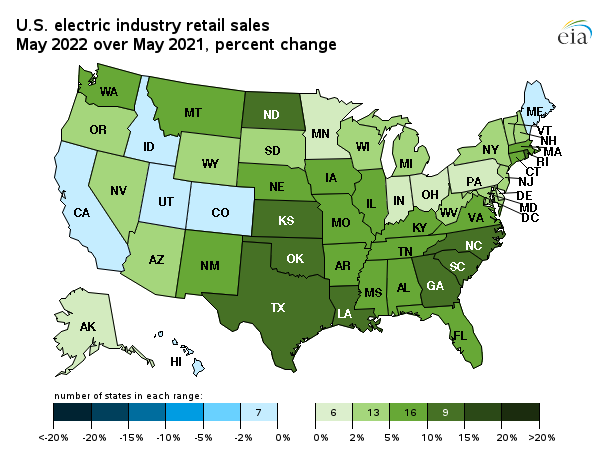 Thirty-seven states had retail sales volume increases in February, led by Arizona (up over 9%), Montana (up almost 7%), and Idaho and North Dakota (both up 6%). 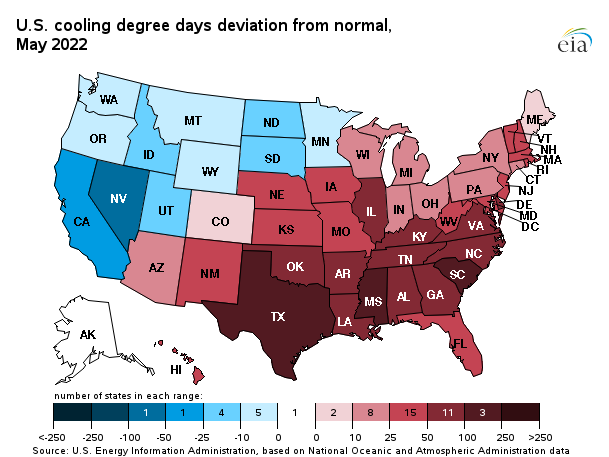 Heating Degree Days (HDD) were down in 3 states compared to last February. Alaska had the highest percent drop, falling just over 4%. Texas followed with a drop of almost 3%. Forty six states and the District of Columbia had a greater percentage of HDDs than February 2018. Florida had the highest increase in HDDs, up over 111%.The next two states with the highest increase in HDDs were located in the West. California had an increase of over 52% and Arizona had an increase of almost 50%.